The martyr sacrifices themselves entirely in vain. Or rather not in vain; for they make the selfish more selfish, the lazy more lazy, the narrow narrower. - F.N. Today is a good day to recognize someone, a good day to tell the world how proud I feel, a good day to let someone know they are the very best at what they do - and that despite the attitudes of others, they should never change who they are and how they conduct themselves. Today I want my sister to know how amazing she is. I want her to know that she is strong, amazing and impressive. I have been reading up on an old gal, Florence Nightingale, and my research has led to me to see something that I have always believed. 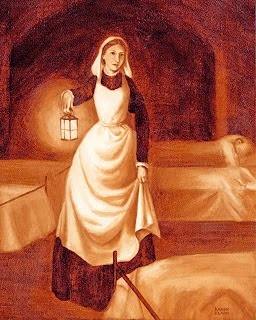 Florence dreamed up modern nursing, she took nursing to a new level, she established the first secular school of nursing and she's known, with her lamp, for making her night rounds to check on her patients. I found an old playlist the other day, "Sleepy Stets" it's called. I remember making it, it was going to be what I would play while my baby fell asleep at night and during his naps. It's a beautiful playlist, sweet country songs, Jack Johnson, Ben Harper and of course, Iz. One word as a theme for the year. To my faith - may it continue to grow and blaze, setting my heart on fire. To my husband - my bestfriend, my partner, may we continue to love and respect each other with understanding. To my son - may you continue to teach me things about life, and myself, that I have been so oblivious to. To myself - may you hold strong to who you are, take time for yourself, love yourself and run. Mi fido di te. And so I build this year on devotion. Intentional devotion in all that I do.